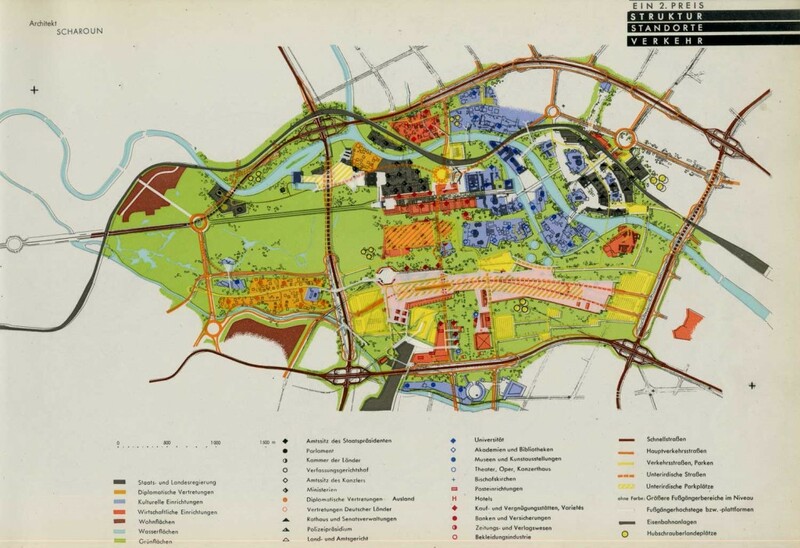 After devastation caused by aerial bombardment during the Second World War, a competition was held for the rebuilding of the central area of Berlin, following confirmation by the West German Bundestag in 1957 of the status of Berlin as capital of the Federal Republic. With an international jury, architects from nine countries were invited to participate including Hans Scharoun, Le Corbusier, and Mart Stam. 149 entries were received with 10 entries submitted from Great Britain. The largest entry of participants were from Germany. There were 10 successful competitors; the first 5 projects went to German practices. Spengelin, Eggeling and Pempelfort were the winners of the first prize. 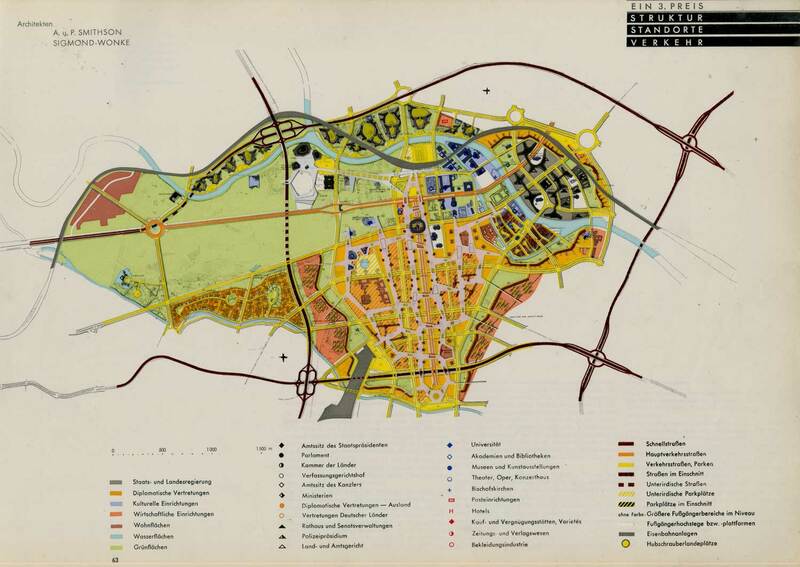 The second prizes went to Hartmann, Nickerl and Scharoun. Alison and Peter Smithson with P. Sigmond-Wonke, London, won third prize, along with Kern, Rummler, Schoter and Fleischer, Kreidt. 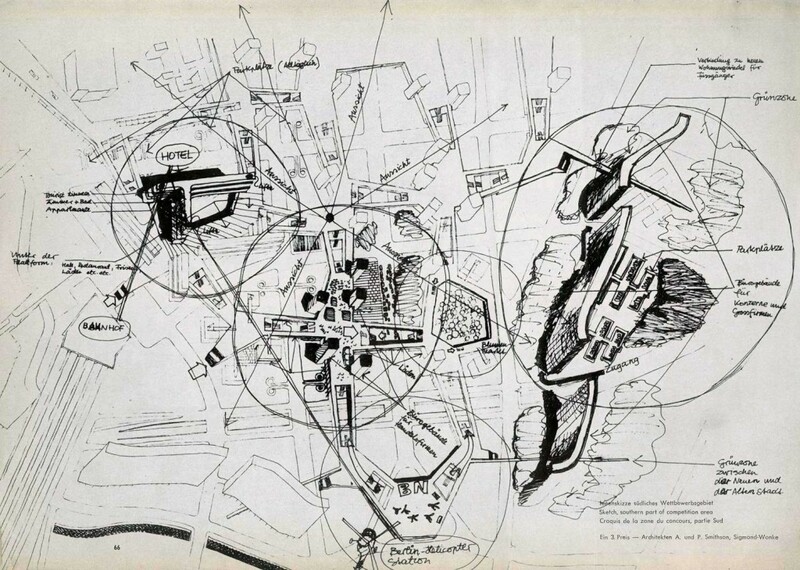 Many of the proposals emphasised the separation of motor and pedestrian traffic; Scharoun, for example, proposed most of the motor traffic underground. The project in the end could not be built due to the economic and political climate. The city planning competition ‘Hauptstadt Berlin’ was widely published, including in a large format book entitled Berlin: Ergebnis des Internationalen städtebaulichen Ideenwettbewerbs Hauptstadt Berlin, published by the Federal Minister of Housing (Stuttgart : Krämer, 1960). The AA Library copy was presented by AA Secretary, Mr. H.G.W. Alexander, and given to him in 1961 by Peter Poelzig (1906-81) who taught at TU Berlin (and son of Hans Poelzig). The book featured several of the competition proposals including that of A. and P. Smithson with P. Sigmond-Wonke, London; their design uses three clear colour plastic overlays to show street patterns, site and traffic layout.